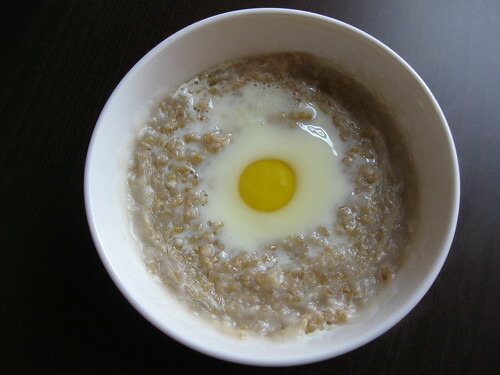 I ran an experiment to see if I could cook an egg in a bowl of cooked steel cut oats. The experiment was a failure. I got everything as hot as I could. 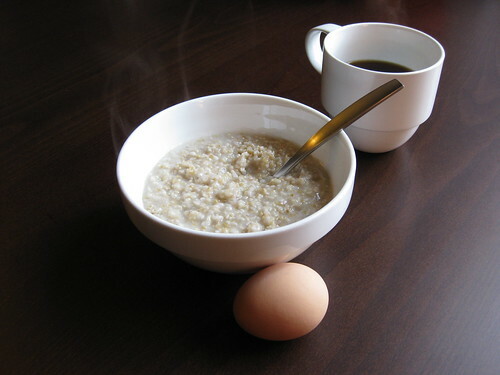 I warmed up the egg in hot water and even prepped the bowl by filling it with boiling water. This is about a minute after cracking the egg into oats. As you can see, the egg did not cook. After waiting a couple minutes and realizing the egg was not going to cook, I relented and stuck the whole thing in the microwave. Even then, the egg didn’t cook very evenly. In this picture, the bottom of the yolk is solid and top of the yolk (and the whites) are still quite runny. Why did I do this? To quell my curiosity.